To celebrate the 10th edition of Steve's 25 Days of Christmas Music, we're hosting a large feast. Well, a feast of Christmas music! So gather around the table, let Aunt Bethany say "Grace", and be prepared to dig in to some food-oriented tunes. Welcome to a Culinary Christmas! Each day until Christmas I'll share a song that references food and/or drink in the lyrics. We've got it all covered from figgy pudding, sugar plums, corn cob pipes, and even vegetarian options! (However, we make no promises about songs being gluten free.) You'd be surprised how many Christmas tunes attempt to keep our stomachs happy. And as always here during Steve's 25 Days, we'll never repeat the exact same song we've used in previous years, so be prepared for unique bites of holiday fun! 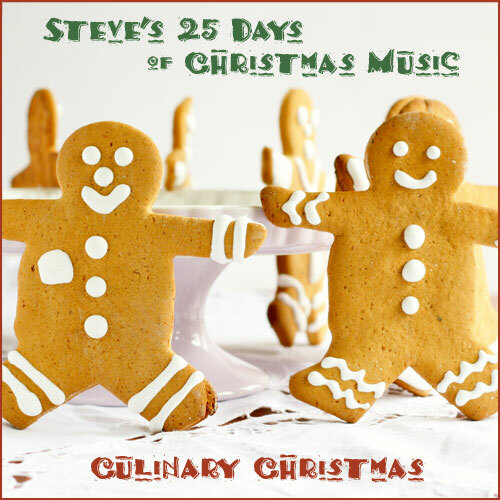 As a special treat, song archives from previous years of Steve's 25 Days of Christmas Music are also available for a limited time. The 253 selections of music from these previous years plus the new 25 songs provide a combined 14.4 hours of listening enjoyment. Thanks for visiting. I hope you enjoy this virtual Christmas gift!